And the disastrous weekend series with Philadelphia met the absolute worst case scenario the Mets could have envisioned. The Mets have played against the Phillies in these last two series the way they used to play against the Braves. They did absolutely everything wrong. They have lost 8 in a row to Philadelphia now, after starting the season 6-2 against them. This was by far the worst game the Mets played all season. The Mets made 6 errors. LoDuca throwing error in the first inning. Reyes makes two errors on the same play in the second inning lead to two Philadelphia runs. Moises Alou drops a fly ball by Rollins leading to another run in the 4th inning. The normally sure handed Luis Castillo made two errors on the same play in the apocalyptic 6th inning, although by rule he could only be charged with one. But more on that later. The last error was a meaningless one by Conine in the 9th inning. But it wasn't just the errors that killed the Mets in this one. It was the walks. 11 of them in all. 6 of them by Perez who ended up allowing 3 unearned runs. Perez had to be removed in the 5th inning after a double by Rollins made the score 5-2. 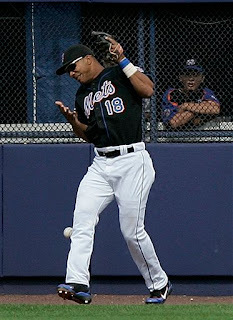 Then the Mets got back in the game on one swing of the bat by the mighty Carlos Beltran. David Wright is getting all the MVP chants, but with 2 on and a 3 run deficit, Wright flied out, and Beltran tied the game. But it didn't last long. Mota walked Burrell to lead off the 6th. But he got Howard to hit a sure double play ball at Castillo who dropped it, then rushed the throw to second, and it was wide and they couldn't even get one out. Then Mota walked Rowand to load the bases, and that was his afternoon. Jorge Sosa came in, walked the first batter he faced, then gave up a grand slam to Greg Dobbs to put this one on ice. David Wright entered the 30/30 club with a home run in the 7th inning. The Phillies had the leadoff man on in the first 7 innings of this game. The Mets used 8 pitchers, a team record. The Mets are 19-6 in their last 25 games against teams not from Philadelphia. The Mets finish with 13 games against the Marlins and Nations. If they win 7, the Phillies have go to 10-4 to tie them with 90 wins. Then the Mets would have to make up a rained out game against the Cardinals.